Toyota of Santa Fe Wins 2017 DealerRater Toyota Dealer of the Year Award Award recognizes top U.S. and Canadian auto dealers who demonstrate excellent customer service as expressed by consumer reviews written on DealerRater. The dealership is also among the top auto dealers in the U.S that demonstrate excellent customer service, as rated by online consumer reviews for the second year in a row! Toyota of Santa Fe has achieved consistently high scores on the DealerRater website, placing it among the top dealerships nationwide. 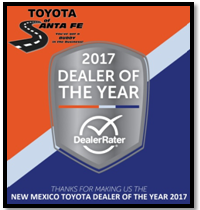 Online shoppers visiting Toyota of Santa Fe’s dealer page will find a “2017 Consumer Satisfaction Award winner” badge on their profile to instantly recognize it as a high quality dealership. “We are very proud and thankful to our employees and customers.” says Buddy Espinosa, General Manager. “Today’s car shoppers pay attention to reviews and a dealership’s online reputation, which makes the significance of the DealerRater Dealer of the Year Awards crucial to dealers looking to thrive in today’s business environment,” added DealerRater CEO Gary Tucker. 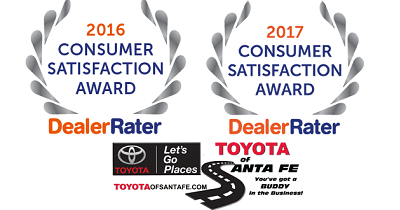 Toyota of Santa Fe has also been awarded a 2017 DealerRater Consumer Satisfaction Award, an annual recognition given to auto dealerships that deliver outstanding customer service as rated by online consumer reviews. DealerRater, the world’s leading car dealer review website, created the Consumer Satisfaction Award program to let online car shoppers instantly spot dealers that provide high-quality customer service. “We’d also like to congratulate Toyota of Santa Fe and all of our Consumer Satisfaction Award winners,” said DealerRater CEO Gary Tucker. “DealerRater’s extensive review database allows shoppers to identify dealerships that are providing excellent customer experiences, and it’s clear that Toyota of Santa Fe is hitting the mark in the U.S.” Toyota of Santa Fe has demonstrated consistently high PowerScore™ ratings for customer satisfaction, placing it in the top of its class. The PowerScore is determined using a Bayesian algorithm that factors the dealership’s average DealerRater consumer rating and the total number of reviews written about the dealership during the 2016 calendar year.